Gaston was a hurricane when the Global Precipitation Measurement mission or GPM core satellite passed overhead and found heavy rain occurring in the storm. GPM imagery also showed that wind shear was stretching the storm out and making it appear elongated from space. Gaston became the 3rd hurricane of the season early this morning, Aug. 25 (just after midnight EDT) as the storm was moving northwestward into the Central Atlantic about midway between the Leeward Islands and the Cape Verde Islands before weakening back into a tropical storm less than 12 hours later. Gaston is continuing to battle relatively strong environmental wind shear brought about by an upper-level low pressure center positioned to the west of Gaston. Winds flowing counter-clockwise around the upper low are blowing from the southwest while Gaston is moving northwest. These opposing winds are causing Gaston to become tilted and make it difficult for the storm to consolidate the energy being released through condensation in embedded thunderstorm updrafts. 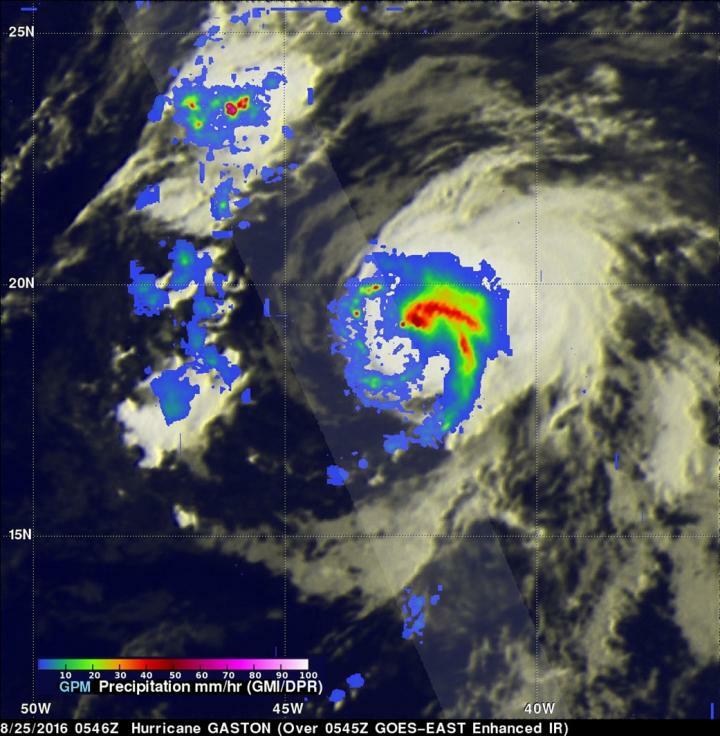 GPM captured an image of Gaston early this morning at 1:46 a.m. EDT (5:46 UTC) soon after the storm became a hurricane. When GPM passed over the storm, the National Hurricane Center (NHC) reported that Gaston had maximum sustained winds of 75 mph, making it a minimal hurricane. GPM is a joint mission between NASA and the Japanese space agency JAXA. At NASA's Goddard Space Flight Center in Greenbelt, Maryland, rain rates derived from the GPM GMI (over the outer part of the storm) and DPR (the inner part of the storm) were overlaid on enhanced infrared data from NOAA's GOES-East satellite to show the location of the heaviest rainfall within the entire storm. The composite image showed Gaston was not circular, but very asymmetric. Heavy rain with rates of around 50 millimeters per hour (~2 inches/hr) were occurring near the center and most of the rain was located north and east of the low-level center of circulation, which reflects the effects of the southwesterly wind shear noted by NHC. These two opposing forces will determine Gaston's intensity over the coming days. At 11 a.m. EDT (1500 UTC), the center of Tropical Storm Gaston was located near latitude 20.4 North, longitude 44.4 West. Gaston is moving toward the northwest near 17 mph (28 kph), and this general motion is expected to continue through Friday, Aug. 26. A turn toward the west-northwest and a decrease in forward speed are expected on Saturday, Aug. 27. Maximum sustained winds have decreased to near 70 mph (110 kph) with higher gusts, and some additional weakening is possible today. The estimated minimum central pressure is 992 millibars. Initially, Gaston should continue to feel the adverse effects of the wind shear; however, NHC is forecasting the shear to weaken after a day or so and for Gaston to become a hurricane once again as it moves over increasingly warmer waters. Gaston is expected to continue moving generally to the northwest over the next several days but remain east of Bermuda before turning back to the northeast.